I can recall the first time actor Ricardo Cortez made an impression on me. It was during my teen years and the local CBC channel was showing not-the-usual Frank Capra films on the late show. Titles included American Madness, Broadway Bill, Dirigible, Platinum Blonde and The Younger Generation. In The Younger Generation Ricardo Cortez played Morris Goldfish who turned his back on his family and heritage and lost everything. The film is part silent and part talkie and a bit choppy to watch, but it moved my sentimental teenage soul deeply. The association I had with that emotional viewing made Cortez a welcome sight in other movies. I became extraordinarily fond of his voice and looked forward to the times he would actually play a good guy instead of a louse. I often wondered about his career, which included so many B pictures. I needn't wonder any longer thanks to Dan Van Neste's book about Cortez, The Magnificent Heel, now available from Bear Manor Media, I enjoyed an advance copy which answered all my questions and more about Ricardo Cortez. Will Ricardo turn out to be the hero in his own story? First things first, let's get the name right. the man with the exotic name was born Jacob Krantz in New York City. Signed by Paramount Studios as a back-up Valentino, the name and a phony biography was foisted upon the young actor anxious to take advantage of the opportunity. Shades of Morris in The Younger Generation, minus the breaking with his family. In fact, two of his brothers followed Jacob/Ricardo into the motion picture business. Bernard Krantz in production/adminstration and Stanley, as Stanley Cortez, the acclaimed cinematographer (Night of the Hunter). The name worked, although it was a source of consternation at times such as when fans expected Ricardo to able to speak Spanish and when it appeared he was denying his Jewish heritage. Dan Van Neste takes us on a journey to the NYC of the early 20th century and the hard life for immigrants and sensitive lads. We vicariously live the life of a theatre mad youngster with movie ambitions in the early days of motion pictures on the east coast. It seems easy to an outsider; step A get a movie role, step B get a bigger movie role, step C sign a contract and become a star. Life is not like that. And the movies are not like the movies. We learn about the cost in time, money, emotion and energy for success in the high voltage industry of motion pictures. 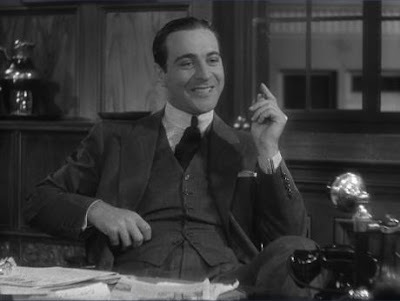 Ricardo Cortez in The Magnificent Heel is not just a subject, he is a young man striving for a better life, a studio commodity, a dedicated professional and a man with personal troubles and flaws to overcome. I would say that Ricardo does become the hero of his own story, a very human hero. Highlights of the journey include the machinations of studio contracts and publicity. The egos which clash, and those which come together in the industry. Conflicts of work and personal lives. Privacy vs. the public life of the business. We learn a lot about how the business of show works in its daily grind and its "big picture" necessities. The people that surround Ricardo, their impact on him and his impact on their lives. Ricardo was a man of varied interests and talents beyond being the screen's first Sam Spade, and a pre-code cad. Finance, fashion and athletics combined with a wide interest in the arts create an engaging personality. 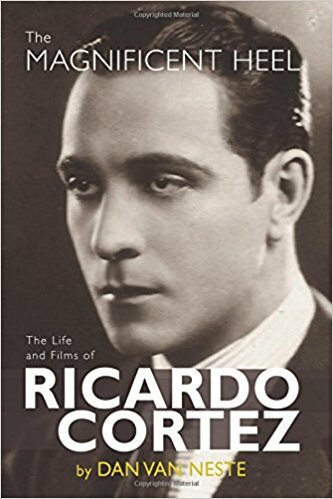 Part II of the book is a fascinating stroll through Ricardo Cortez's filmography. Each film recounted with fascinating behind-the-scenes details and contemporary reviews. It is well that we look at classic films through the eyes of those seeing them in their time, as well as through our own 21st century lens. I found The Magnificent Heel, The Life and Films of Ricardo Cortez enlightening and interesting and recommend it as a fine addition to a classic film library. Dan was gracious enough to answer a few of my questions regarding his work. How/when were you first drawn to Cortez? Seems like I've always been a fan of Cortez. As a boy I was intrigued by villainous actors, and he always stood out. What was it about him/his career that inspired your book? Since I began writing about classic films and vintage filmmakers approximately 30 years ago, my passion has been to do original work and make small contributions to film history. One of the ways I've tried to contribute is by writing about lesser known individuals, talented people who made significant contributions to the film industry, but for one reason or another, have never been the subject of biographical books or received the attention their work merits. To me Cortez was the perfect subject. He was an important actor of the late silent and early sound eras, appearing in 100+ films during a five decade long career in the movies. Although he is best known as a screen villain, Cortez was a tremendously charismatic and versatile actor who could play any type of character in any genre. He worked with some of the greatest directors, actors, and other filmmakers in cinematic history, holding his own, sometimes dominating scenes even with the likes of legendary stars such as Crawford, Francis, Davis, Cagney, Beery, Swanson and Lombard. Yet with all these accomplishments, people are largely unfamiliar with Cortez today, and those who do remember him, know little about him. My book is an attempt to draw attention to this underrated, long neglected star. What kept you going during the tough times in the search for material? That's a great question! In my opinion, maintaining one's enthusiasm is the toughest challenge a book author faces. It was particularly true on this project, because of the difficulty of the research. Cortez was an intensely private guarded individual who didn't leave diaries or papers, rarely did interviews, and when he did, they were rarely substantive. To make matters worse, he died so long ago, most of his coworkers and contemporaries were deceased or simply too old to do interviews. I was forced to piece together his story bit by bit over a long period of time. It was terribly challenging and often very frustrating! It took me four years to complete work on this book. There were many times I didn't think I would be able to finish it, but somehow, someway I kept moving forward mainly because I had invested so much time in it, and because I was inspired by my subject who never gave up, overcoming enormous obstacles to achieve his goals. Whenever I was stuck on something, I would work on something else. In the end, my patience and perseverance paid off, but it is important to note The Magnificent Heel is the only biographical project I have completed in thirty years that was done out of chronological order. I don't recommend writing a biography that way, but like the old saying, "You do what you gotta do!" Are you taking a break or already starting on your next project? Up until the Cortez book was actually published in March, we were still busy working on it. Since then, I've been preoccupied promoting it. However, I must admit, in the back of my mind, I'm always thinking about what's next. In my case, I have two things in mind. For a very long time now people have been urging me to put together a collection of my articles. For years I did in-depth pieces for a variety of publications, most especially Classic Images and Films of the Golden Age magazines. Many of my articles included original interviews with my subjects, most of whom are now deceased. I'm really proud of the work I did and would like to have some of my best work preserved in book form. Now seems like a good time to pursue this project. In addition, I would like to do another biography. I have a handful of possible subjects in mind, but I'm not overwhelmingly enthusiastic about any one of them at this point. Guess I'm still searching for the perfect subject. Suggestions are welcome. Anyone who would care to suggest a subject can write me through my personal website. By the way: Dan's book spent a couple of days with me at dialysis clinic. My nurse insisted that when I lay the book down on the side table I should be careful to place it face up so that she could see Ricardo Cortez as she passed by. Our "Latin Lover" still got it! It's one of three film books on my list. I'm very happy with this book about Ricardo. I learned a lot of things, and I'm glad I read it now. I've picked up a copy of Our Mutual Friend and, while I'm not a slow reader, I think this summer will end up being a one book summer. I just recently became aware of Richardo. The movies that I have seen, I didn't see him as a heel. Guess I have some rewatching to do. Thanks for sharing a The Classic Movie Marathon Link Party. Ricardo didn't always play a cad, but he did excel at such roles. A very interesting actor and man. We're lucky that many of his films show up on TCM from time to time. In fact, a couple of weeks ago they devoted the daytime to his work, and it wasn't even his birthday! Excellent review of this book - and a very interesting subject. I like your interview as well. Great job. I've been hesitant to take on such a project in the past, but it did me good to stretch. There is certainly a variety of biographies on the market these days. Thanks. We'll have to yell at TCM to give us another Ricardo day like the one about three (?) weeks ago. They've got a lot of material.